I hope that by now you've heard about our new Technically Speaking webcast series. The goal of this series is to help you understand and work through issues with your data so that you can focus on answering your most important questions. It features JMP team members sharing data case studies and covers topics ranging from design of experiments to data cleanup, results visualization, SPC and model comparison. Recently, I recorded a session for this series on a workout data project I’ve been doing since early in the year. I also spoke about my project at Discovery Summit 2015 in San Diego (you can check out my slides) and blogged about it earlier in the year in my JMP User Community blog and in my Fitness and Food series here. Custom maps of body shape help me track and understand my workout data. Use many of the data cleanup and categorization features in the JMP 12 Recode platform. 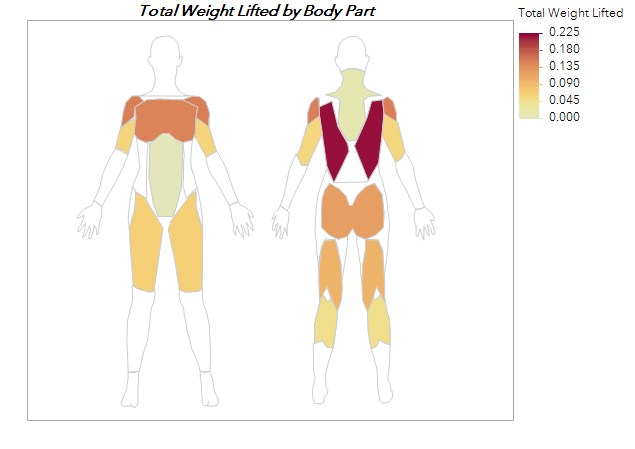 Develop a custom set of body map shape files (which you can download from the JMP File Exchange). Create Graph Builder visualizations of my workout patterns. Make App Builder dashboards with selection filters to further explore my data. You can download a sample data file that goes along with this new webcast. It includes data from the month of January with total weight lifted summarized at the exercise level. If you’re interested in creating your own workout data table, the page also includes a template file you can use to get started. Happy tracking, and let me know what you think of my Technically Speaking session!